Graffiti is surely as old as mark-making itself. 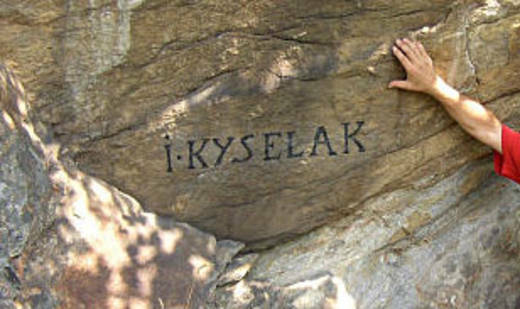 But Joseph Kyselak, born in 1799 in Vienna, might be the first graffiti writer as we know it, making a name for himself by simply writing it on things. At some point in the early 1820s, Kyselak made a bet with his friends that he could make himself famous throughout the vast Austria-Hungary Empire in just three years. His chosen method was nothing less than modern-day tagging. Starting in about 1825, he traveled on foot (he was an accomplished mountaineer) all over central Europe, writing “Kyselak” in red and black on public surfaces: on buildings, bridges, furniture, trees, and the most inaccessible mountains. Soon, the name “Kyselak” was known far and wide, and within half the time that they had given him to achieve the task, his betting partners had to admit that he had become famous throughout Austria- and they paid him his winnings. But he didn’t stop there. He continued writing “Kyselak” until he died, which was in 1831. Some of his tags remain, even 180 years later. A legend tells of a time that Emperor Franz actually summoned Kyselak to the palace for writing on an Imperial building. He ordered Kyselak to stop writing his name in public, and Kyselak acted properly sorry and agreed. But as soon as Kyselak had left his office, the Emperor found that the infamous vandal had tagged his desk. Another time he was once asked by the police not to paint his name on a new bridge over the Danube until the opening ceremonies were over. Kyselak agreed and even waited one more week to paint his name on the new bridge. Kyselak’s prolific tagging, and the fact that he always wrote his name and nothing else- no message or context- makes him the grandfather of modern graffiti culture. How many of today’s tags will be around in 180 years?